Court documents revealed today sure seem to point straight in that direction. Exhibit A: "On June 15, 2007, an obviously high-level risk management officer for Chase’s investment bank sent a lunchtime e-mail to colleagues to report that another bank executive 'just told me that there is a well-known cloud over the head of Madoff and that his returns are speculated to be part of a ponzi scheme.'" Exhibit B: "Even before that, a top private banking executive had been consistently steering clients away from investments linked to Mr. Madoff because his 'Oz-like signals' were 'too difficult to ignore.'" Exhibit C: "The first Chase risk analyst to look at a Madoff feeder fund, in February 2006, reported to his superiors that its returns did not make sense because it did far better than the securities that were supposedly in its portfolio." Uh oh. Looks like we might have another Abacus-like scandal in the making. And, yes, there's more. Ex. D: According to Deborah Renner, one of the Madoff trustee's lawyers with Baker & Hostetler, "Incredibly, [JPMorgan's] top executives were warned in blunt terms about speculation that Madoff was running a Ponzi scheme, yet the bank appears to have been concerned only with protecting its own investments." And, finally, Ex. 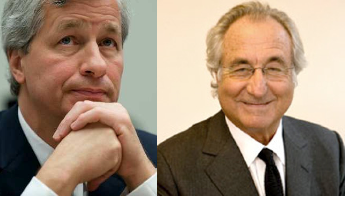 E: "One discussion of the bank’s 'due diligence' on Mr. Madoff was aired on June 15, 2007, at meeting of the bank's Hedge Fund Underwriting Committee, [which was] comprised of senior business heads and bankers, including individuals such as the chief risk officer and the heads of equities, syndicated leveraged finance, sales, and hedge funds." All of these dirty details (along with a few others) were revealed after documents involved in a lawsuit against JPMorgan went public. The lawsuit was filed this past December by Madoff's bankruptcy trustee, Irving Picard. Let the PR games begin.